About two weeks ago, Sheena and I visited the Godmans and Hawkers at their cottage in Port Severn, ON. 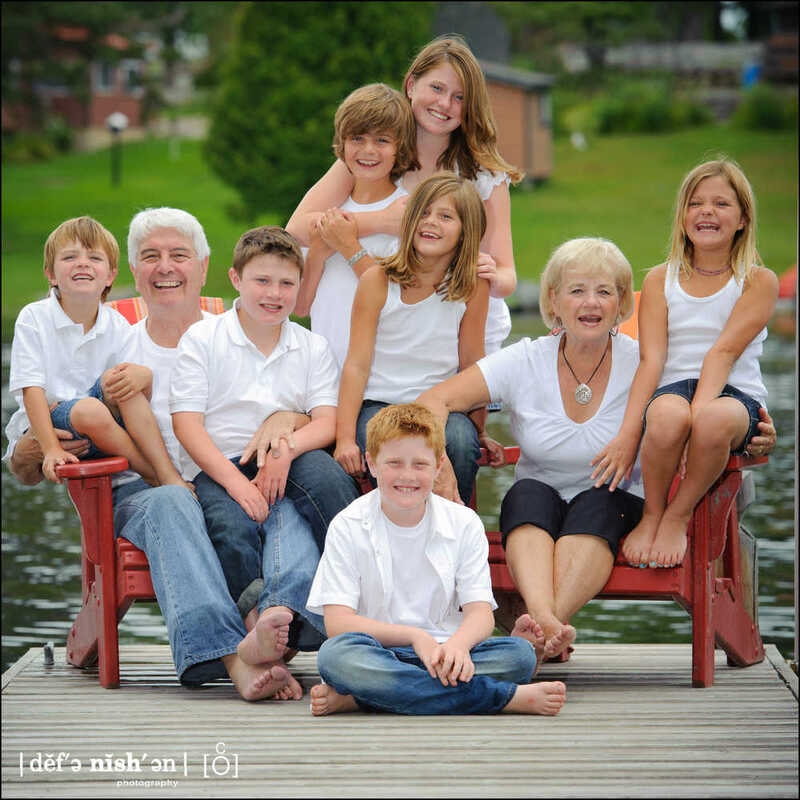 We know how hard it is for extended families to get together due to everybody's different schedules, so it is not often that we have the opportunity to photograph larger family groups. Sheena and I knew that we were requested to take a large group portrait of 15 people so our first challenge was finding a location to place everybody. The stairs to the main cottage were perfect. Grouping everybody into their family units was next followed by Sheena providing our on-location lighting (yes, she is very pregnant so I didn't have her stand anywhere too dangerous). After the large group portrait, we moved to the dock where we took individual family portraits and had some fun. The weather was great, however, taming the strong glare from the water meant that we were using all our lighting on max power so that we would be able to shoot and have the background expose properly (so that it wouldn't be blown out). Most people tend to think that using a flash is 'bad' or to be used only at night, however, flash mimics the colour of daylight so it allows you to add light where you need it so that you are not stuck relying on available light (in this case, the sun, which popped in and out and was not the most consistent lighting that day). The families were so much fun to work with and it was so nice for Sheena and I to get out of the city and enjoy the outdoors for a day.